If thoughts of Florida bring up memories of Disney World and Daytona Beach, you will need to give it another visit. 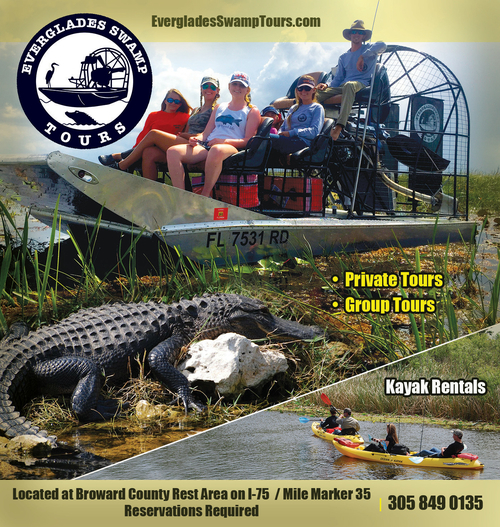 Florida has more to offer than just central Florida attractions. South Florida has a number of family-packed vacation spots that will leave you and the kids wanting to head back for more. Fun-filled and adventure soaked, these are the stuff vacations are made of. Don't settle for boring holidays with limited excursions. Pack up your partner and kids and head on down to have some low cost family fun in South Florida, destination: Miami-Dade, Monroe, Broward, and Palm Beach counties. Charnow Park is situated on the Hollywood Beach Boardwalk, providing the ideal spot for children to just relax and have a good time. Including a gazebo which parents can hire out for birthday parties or special celebrations, this locale also offers various kids games, fun vehicle rentals and a multi-jet water fountain that will entertain the kids for hours. Ideally situated with a view of the ocean, this is one great place for kids to hang out. Once they've had their fill of the park, the whole family can enjoy the award-winning Hollywood Beach for some sandcastles and waves. Fresh air and hours of activity are the order of the day here. Send the kids off to roller skate or cycle on the paved walkways while you enjoy a relaxing bout of fishing off the South Pointe Park Pier. You even have the opportunity of entertaining the tiny ones in the toddler splash park area, making it a memorable vacation for all. South Pointe Park is probably most famous for its waterside sunsets, making it the ideal opportunity for you and the family to have some picture perfect snaps. You might even catch a huge cruise ship in the background! It is still unclear as to who has the most amount of fun, parents or their children, where this park is concerned. Featuring a water park (seasonal hours) that will have you going back for more, this park also offers RV camping facilities as well as two mini-golf courses and a driving range making those vacations extra special. Tennis enthusiasts will be happy to know there is a tennis complex in case they needed to work on their serve. For those hoping to waterski and wakeboard, this is the perfect venue for it during the on-seasons. This park is also a great option for a day pass, as it charges no entrance fees during the week and only a small entrance fee over weekends. Picnics, playgrounds, and horses sum up this gem, with hours of entertainment available for the whole family. There is also fishing, golfing and the renowned Butterfly World all in the same park. For the little ones, there are model train rides provided on certain weekends as well. As if that isn't enough, an education farm is also part of the package. A favorite among athletes, the park also sports two certified 5k courses, which means you won't have to give up training for your triathlon while on holiday. The petting zoo is one of the main attractions here, as you are able to go into a barn while surrounded by goats, sheep, and even a pig. They also hire out bikes on which to explore the mountain bike trail. Featuring a playground that will make most adults want to play, the kids won't want to leave in a hurry either. While they're playing, the parents can enjoy some fishing or get the grill ready for some delicious barbeque. Definitely on the list for the active family, this park sports a few soccer fields, a large golf course, trails for running, hiking and biking as well as volleyball and tennis courts. It is also a great place for a family picnic, sporting well-kept picnic tables and playgrounds. It also houses the Daggerwing Nature Center with its newly renovated exhibits, trails and special events. The highlight of the park for the kids is the affordable Coconut Cove Waterpark featuring a lazy river, slides, water playground and full-size pool! Adults can enjoy the golf courses and frequent live concerts at the Sunset Cove Amphitheater. Rehabilitation is one of the foundational building blocks ensuring a sustainable future for our planet's animals and places like these are great at teaching these principles to the whole family. Situated below the jail, the farm was initially just a safe haven for ducks who were continually knocked over while crossing a busy road. The tenancy grew due to a newspaper clipping. All animals on the farm needed a new home due to various circumstances and the variety include ponies, ducks, parrots, goats, turtles, lemurs, sloths and even a Burmese python. Entertaining and educational, this facility will not cost you a penny, however, donations are always welcome. Whether your child is a budding marine biologist or an aspiring butterfly conservationist, a visit to Gumbo Limbo Nature Center will be entertaining, educational and memorable. Taking a trip down the Ashley Trail to the Seminole Chickee on the intracoastal which serves as an outdoor classroom, you may come across Florida's very own state butterfly, the zebra longwing. Before taking the trip to Gumbo Limbo, have the kids print out an online scavenger hunt off their website to make the trip even more fun. Four saltwater aquariums house the rehabilitated sea turtles and sport an environment as close to their natural habitat as possible. Be sure to climb the swaying observation tower on the mangrove trial...if you dare! As the name suggests, Robbie's Tarpon Feeding does just that. Providing endless entertainment for kids and adults alike, it's incredible to watch these fish lunge out of the water to consume fish after fish. For those who tend to be a little bit on the nervous side however, Robbie's also hosts snorkeling tours as well as every type of fishing you can imagine. This is a great excursion for the family to enjoy some bonding time while enjoying the fun, sun and waves.